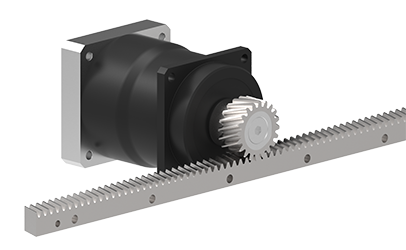 The GAM Helical Rack and Pinion series, along with our broad gearbox offering, provide a complete linear solution. Use our motion control engineering expertise to select the rack and pinion and match it with the right gearbox for your application. What is Rack & Pinion? A linear actuator that converts the rotary motion of the (circular) pinion to linear motion at the (linear) rack. Why use a Rack & Pinion System? A rack and pinion system is the most cost-effective way for linear movements greather than 2 meters. Why use a GAM Rack & Pinion System? GAM matches the high quality rack and pinion with the best precision gearbox for your application. See our Rack & Pinion Systems. GAM offers 3 modules of helical rack in 2 quality levels. GAM rack and pinion systems are engineered to maximize the performance of each component: gearbox, pinion, and rack.